I have read hosts of the most beautifully written accounts of it, and they give one no idea of it at all…so you will never know what Petra is like, unless you come out here... T.E. Lawrence ~ February 1914. This is how Lawrence of Arabia summed up Petra in a letter to a friend. He’s right; it must be seen to be fully appreciated. It is a step back in time to one of the earliest known civilizations. 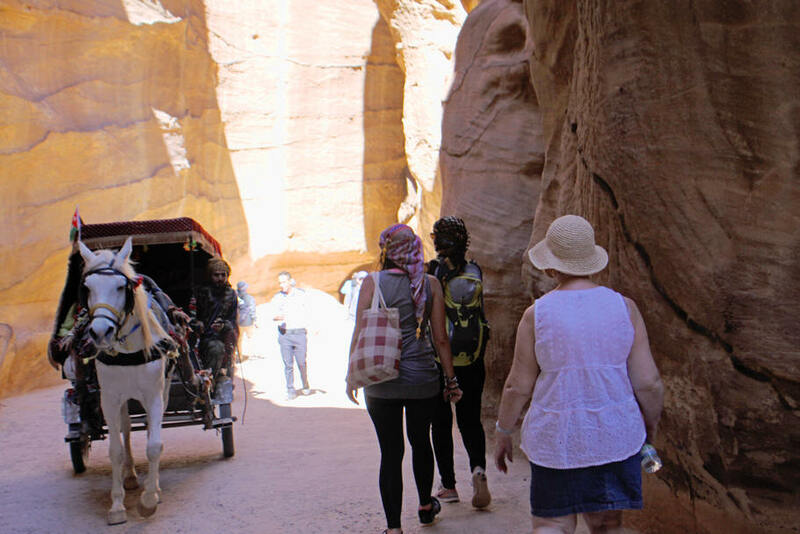 It is one of the new Seven Wonders of the World as well as being named a UNESCO World Heritage Site built by an ancient civilization called the Nabataeans around the third century BC. The Nabataeans were geniuses when it came to harnessing that most precious desert commodity, water. As we entered the site and approached the Siq, a cleft between two towering mountains, we got our first clue as to of the cleverness of the Nabataeans. Along both sides of the Siq they carved channels into the stone to gather and control the water supply. 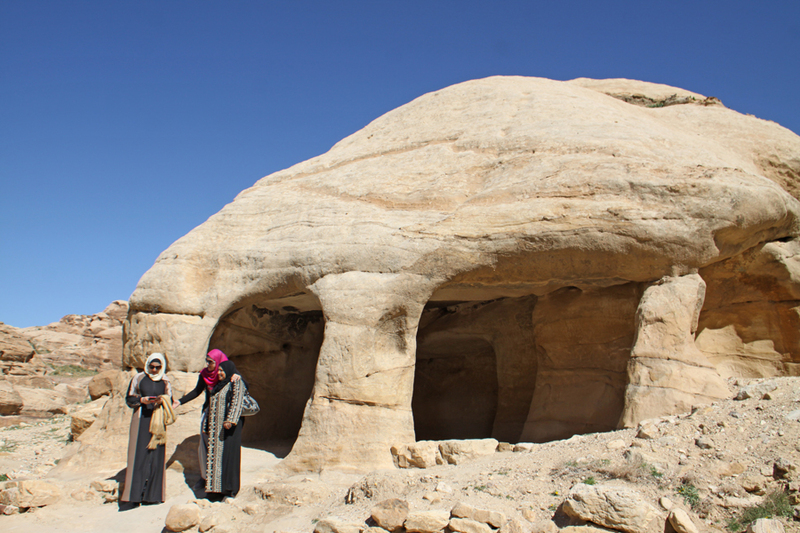 The simple tombs that look like caves with carved entries are your first glimpse of the ruins They were the original Nabataean style tombs. The Obelisk Tomb is the first really elaborate tomb in the site just before you enter the Siq. It shows traces of Egyptian, Greek and Roman styles. The partially visible figure of a man in a cloak, probably the person who owned the tomb, and four obelisks, clearly Egyptian, indicate that there are five people buried here. The tomb rises high above another carved building known as the Bab el-Siq Triclinium that has rounded columns with elaborately carved capitals atop them indicate the Greek and Roman influence. As you journey down the Siq, you will find niches carved within the walls of the cliff at random places. Some display early gods; many are empty. 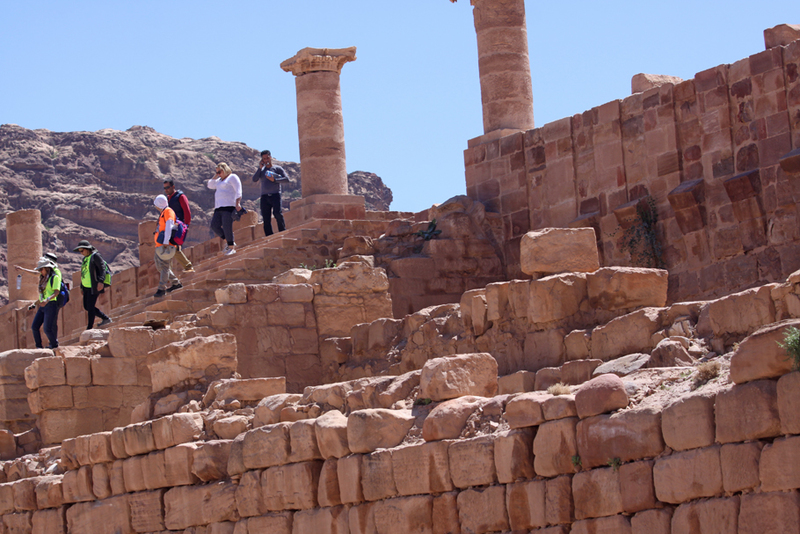 Our guide informed us these empty ones were for the many travelers who came to Petra to use as a brief repository for their own gods’ statures during their visit. 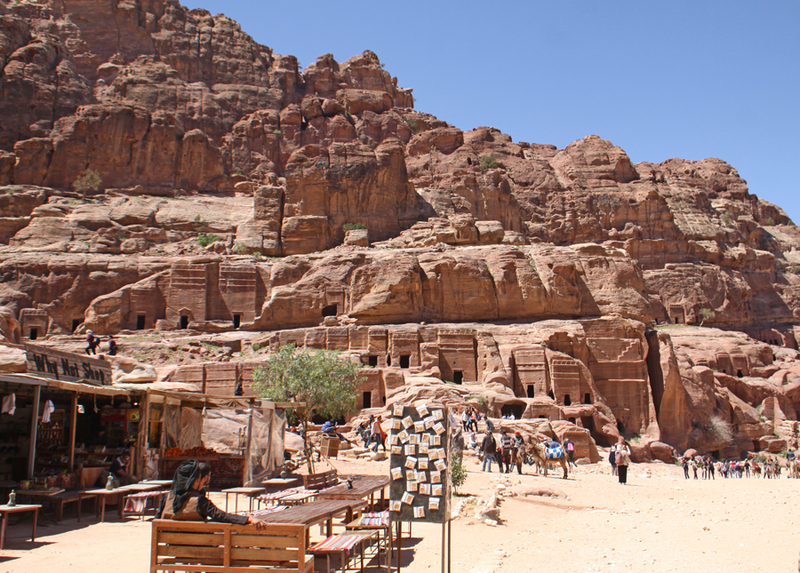 He explained that before the Romans, Petra was the primary center of commerce connecting the spice route. 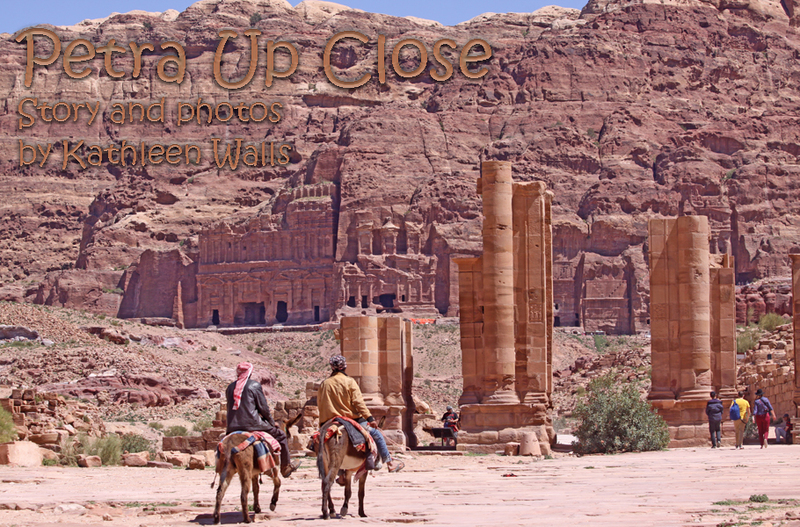 Petra was only open to the highest ranking visitors. Lesser folks would camp outside. As he pointed out, camel caravans with as many as 700 or more camels couldn't fit within the narrow Siq. About half a mile within the Siq, our guide, Mohammed led us over to examine a niche within the wall. Then he led us across and pointed out an attribute on the other side of the canyon after which he told us to turn around. There it was peeping through the narrow opening at the end of the canyon. My first view of the famed Treasury, was a rosy segment framed by the canyon’s limestone walls. It took my breath away. We covered the rest of the distance rapidly drawn by the shining beauty awaiting us at the canyon’s end. Set directly into the mountain, the intricate detail of the workmanship done with primitive tools by a people just entering the Iron Age shames the work of modern carpenters and artisans who have command of the most powerful and technologically advanced tools ever produced. 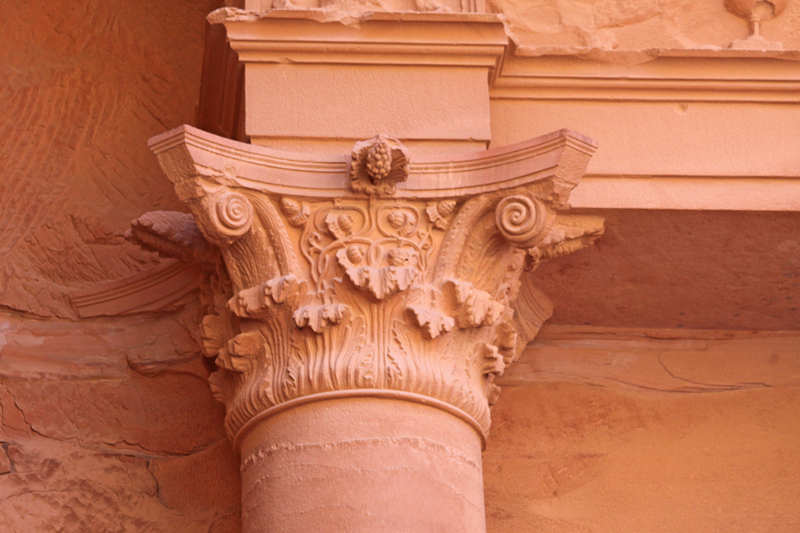 Carved capitals adorning perfectly round columns raise the eye to the heavens. To make this an increasingly unbelievable feat, these were constructed as tombs not homes. The Treasury is the most striking and best preserved of the buildings thanks to the protective mountain walls surrounding it. Seeing it you understand why Petra is called The Rose Red City. The stone has a rose-pink cast that makes it all the more beautiful. The Urn Tomb, perched high on the mountainside, is one of the Royal Tombs. Some archeologists believe it's the tomb of Nabataean King Malchus II who died in 70 AD. Others think it is the tomb of King Aretas IV. Regardless of the resident, the structure is magnificent not only for its elaborate design but its sheer size. The Romans left their mark in the city. The amphitheater was originally constructed by the Naboteans and later Romanized to suit their needs. Roman structures built of limestone rather than carved into the rock did not withstand erosion and earthquakes as well as the Nabataeans’ however there remain remnants of the Great Temple and other buildings. 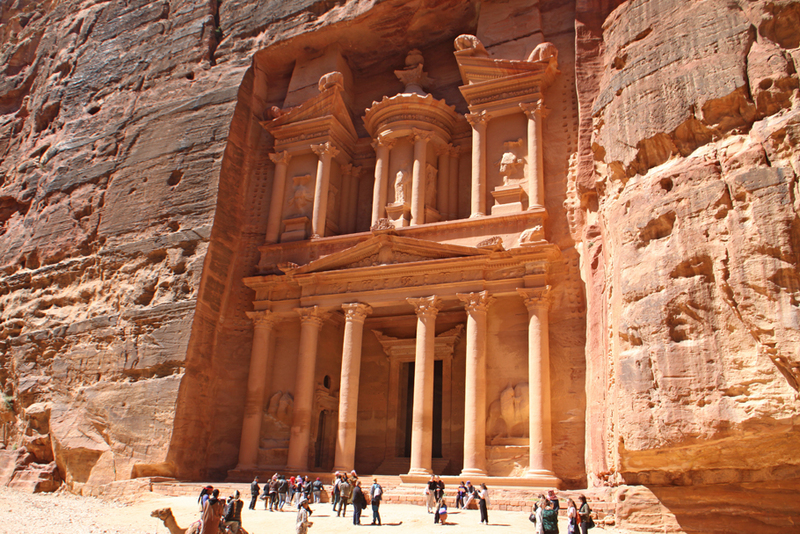 Petra has over 800 monuments, spread out over 102 square miles. And this is only what is already excavated. Our guide told us there is so much more which is still buried and will one day reveal more mysteries. The scale of the buildings is immense. It feels like a city built for giants. Do wear good sturdy walking shoes as the old roman roads and sand surface are rugged especially if you plan to climb to any of the higher tombs. You will pass several snack shops and plenty of stalls and roaming venders most selling silvery bracelets selling around for four for a dinar. The price decreases as you get deeper into the site. Just past the Great Temple, there is a full service restaurant, The Basin. The buffet is great, packed with typical Jordanian dishes. They serve a variety of soft drinks and several kinds of beer. You will not leave here hungry. There is so much to see there. You can choose the 850 steps up the mountainside to the Monastery. 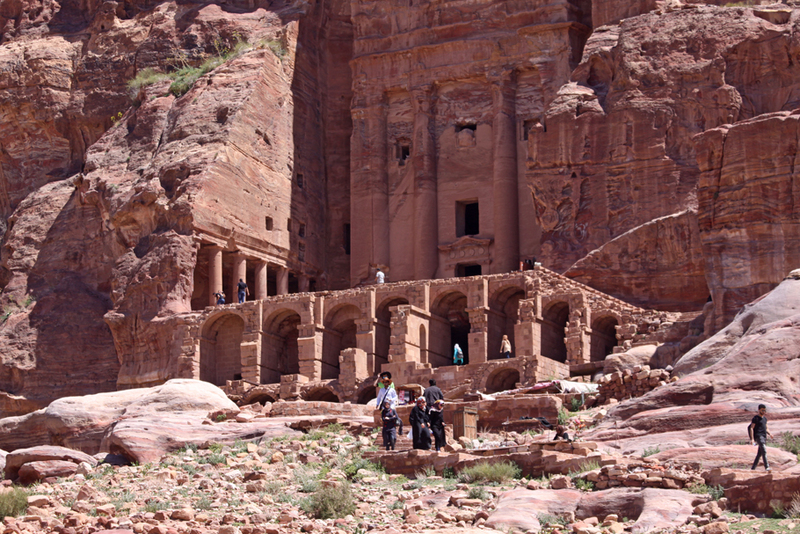 You can scramble around many of the buildings or hike one of the lesser used trails and look for native wildlife like a tiny blue headed lizard sunning on a rock, some of the birds that seem to make Petra home and lots of detail in the carvings. There is a refreshment/souvenir shop located by the Treasury facing the large square in front of it. Those who choose to ride the donkeys or horse carts are coming and going here. 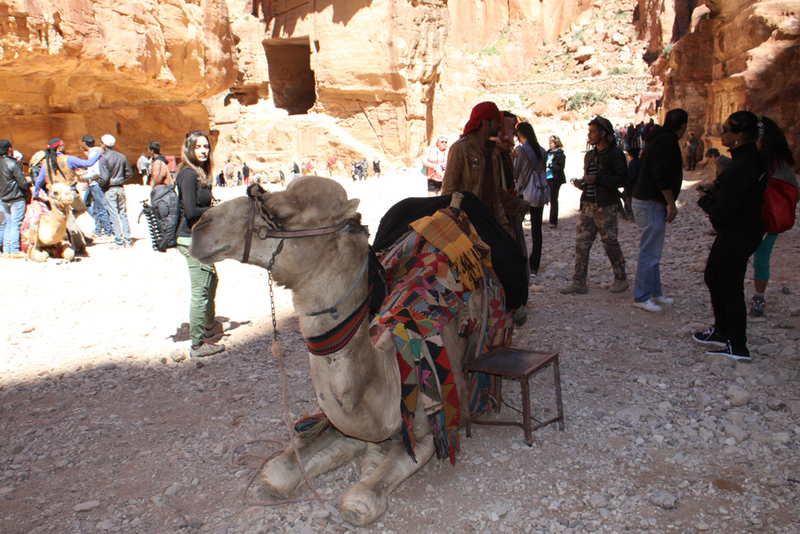 I sat and contemplated the amount of labor that went into carving the Treasury, watched the visitors ride the camels and noted a few of the cats you find everywhere in Jordan. They seemed quite at home in the little shop and among the ancient ruins. It made me wonder if they were direct descendants of cats that might have helped keep the ancient Nabataean city rodent free over 2000 years ago. Petra should be on everyone’s bucket list. It 's a place you will never forget and cannot accurately visualize until you actually see it.